Those interested in click through licences may be amused/shocked by the attached. Title: Dell's Software License Policy: Dude, you're getting screwed. Kat and I just received the Dell Inspiron 5100 notebook we ordered from Dell Canada. We quickly ran across problems. agreements that came with each program that you ordered. read all of the software licenses and agree to their terms. So I called the only Dell number I could find on my documentation (1-800-847-4096) and spoke to a customer support representative. I told her what was on the screen, and told her I couldn't find the license agreements I'm required to read and agree to before pressing any key. She put me on hold while she looked into where the license agreements might be, and eventually transferred me to technical support. The tech support agent told me her database was down, so she couldn't look up anything at all (I hadn't even told her what the problem was yet), and I'd have to call back in an hour. I call back, and speak to a tech support woman. She says: "press Tab." I explain that I can't without saying I've read and agreed to documents I don't have. She says "press page down". Same problem. She says "scroll down". I explain it's not a Windows screen. She says "insert any Dell-shipped CD". I exlpain the problem of opening the CD packaging. She insists I have to press a key. I ask her if she really means that I have to agree to the licenses before it's at all possible that i've read them. She says "yes". I explain that that's not acceptable, and ask for her supervisor. Her supervisor insists it's a Customer Care issue, and not tech support, and that there's nothing he can do. He can't explain why they sent me to him. He enters my info into the call log databse, and I go to call back Customer Care. So back into the hold queue I go. She looked up the call log to get the background info. She insists she doesn't have copies of the agreements, and that I'm supposed to go online and look them up myself. (?!) She says to use a public computer if I have to. I ask how to know what companies have software on my disk. She goes away for a bit, and says she doesn't have that information, and there's nothing they can do. [And there's no supervisor available.] She asks why I don't want to agree to the license. I explain I haven't *seen* it. She says "it just says you won't copyright any of the files". I ignore the mistake, and explain that licensing agreements are long, long documents that say much more than that, and that anyway, the screen says that I have to have *read* it. Eventually she does manage to connect me to Alan Burley (Manager, Customer Service). He said he installs things all the time without reading the license agreements. He says I should just do that. I ask if he's really telling me to lie and to agree to legal documents I haven't seen. He says I don't have to, but the only thing he can do is take the computer back. He says that it's the first time this issue has escalated. He does manage to tell me what software is on the system, and says I need to go to those companies' websites to get their agreements. [Never mind that I need the OEM version and that's unlikely to be there.] I ask _him_ what if this was my first computer. He said I would have to go to a library or a friend's house. He really couldn't send me the agreements that Dell insists I read and agree to before using the computer. He said he couldn't give me his phone number or mailing address, and that he didn't have a boss who could talk to me. It's crazy that it came to this. If they had said *anything* reasonable, we would have been happy to just install Linux on the thing and be done with it. But they were saying that anyone who uses a Dell laptop (with this startup screen) *has* to just lie about having read the licenses, and just blindly agree to them. That's unacceptable enough that it's going back. It's also interesting to note that everyone except Mr. Burley assumed that I was talking about a Microsoft screen which included the Windows EULA, until I told them otherwise. 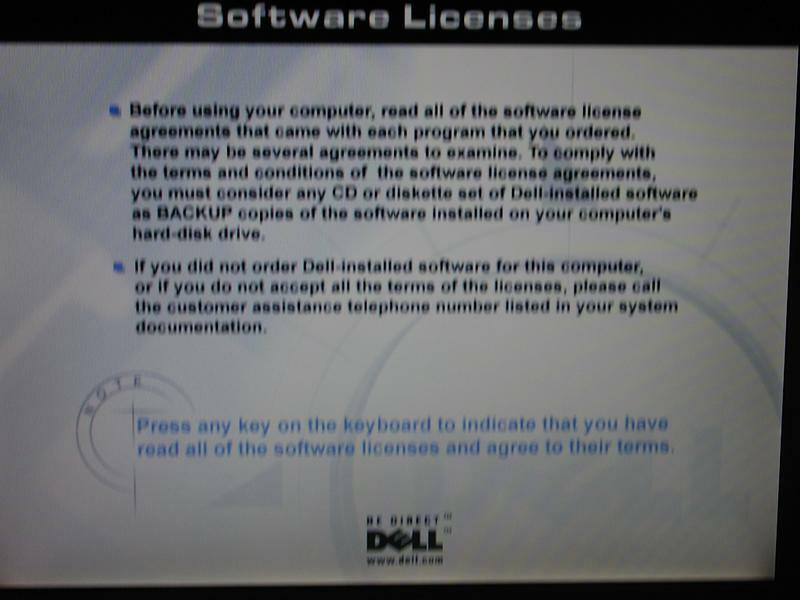 This was a Dell screen, with no EULA, and I'm surprised that none of these people were aware of its existence. This took from around 3pm to around 8:30pm today. I'm just bewildered that Dell corporate policy is that users need to lie to use their new laptops, and to agree to legal agreements that it's completely impossible to have read. This is the next level above "click-through" licenses. Now, they figure no one reads the EULAs anyway, so why bother even providing a copy?